I sometimes wonder how the Communist revolutionary leader Mao Zedong, who warned against taking "the capitalist road," would feel about his face on all those Chinese bills being traded around the world these days. As of this week, the renminbi is being traded in a major way in Canada as well, after Finance Minister Joe Oliver opened North America's first Chinese currency trading hub Monday night in Toronto. The currency has come a long way since the Chinese Communists began printing their own money in 1948 while the People's Liberation Army was still battling nationalist forces for control of the country. After more than 50 years as a completely controlled command-economy currency, the renminbi's great leap forward has only come in just the last few years. "It's a time when you really can use the term 'dramatic,' " David Watt, chief economist at HSBC Canada, says of the currency's move to prominence. Before 2010, the vast majority of Chinese trade was still being conducted in U.S. dollars. In other words, if you wanted to buy or sell to China, deals were made in U.S. dollars. Canadian buyers would recalculate their payments into U.S. dollars, often having to convert their money twice on the way to the supplier in China. But Watts says China's trade has gone through a transformation as increasingly deals are being conducted from beginning to end in its own currency. "In 2010, Chinese trade that was settled in renminbi accounted for 2.7 per cent of total trade," says Watt, quoting HSBC figures. "By 2014, it approached 30 per cent and it's expected to reach 50 per cent by 2020." HSBC is releasing a new survey on the internationalization of the renminbi today. The other huge step for China's money is the bond market. Five years ago, McDonald's Corporation issued its first corporate bonds in renminbi, leading to the joke that RMB (the currency's shorthand), stood for Ronald McDonald Bonds. Three years later. British Columbia became the first foreign government to sell RMB bonds, soon followed by the United Kingdom. Already the renminbi has become the world's fifth most traded currency, beating the Canadian and Australian dollars in 2014. But the final stage in a currency's assent to global prominence is to become a reserve currency similar to the U.S. dollar, the pound sterling and the Swiss franc. Reserve currencies are those that other countries hold to back their own currencies. Watt says the Chinese yuan isn't far away. "With some countries, it is already becoming a reserve currency," says Watt. "Some countries are already holding some renminbi as part of their foreign exchange reserves." The International Monetary Fund has not yet included yuan in its official basket of currencies. Watt says that's coming. While China may want the prestige and economic advantage of having a widely traded currency, there are disadvantages, too. Already there are signs the country's central bank can no longer keep as firm a grip on its own money. For years, governments like the United States complained that the Chinese government was holding its currency artificially low, giving it an unfair trade advantage. Holding a country's currency down is relatively easy because it involves selling billions of dollars worth of your own money into currency markets. China's central bank uses renminbi to buy U.S. dollars and euros and yen and keeps them in its burgeoning reserves. But last week, there were signs the secretive People's Bank of China is doing the exact opposite. 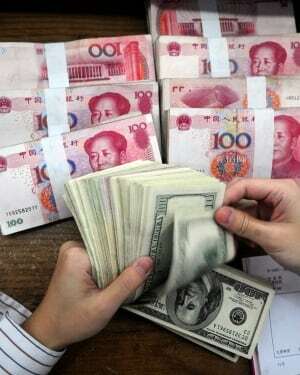 The Financial Times reported that the Chinese central bank was desperately drawing down $3.8 trillion in reserves to sell dollars and buy yuan after global traders began selling off the currency. The FT said Chinese authorities "sought to prevent recent currency weakness from eroding confidence in the economy and inciting capital flight." As many other countries have found, including Britain in 1992 — when traders outbid the Bank of England and sent the pound tumbling — that's the problem with having a lot of your currency in circulation in the world. You are no longer the only ones trading it.